The royal Château de Chambord at Chambord, Loir-et-Cher, France is one of the most recognizable châteaux in the world because of its very distinct French Renaissance architecture which blends traditional French medieval forms with classical Renaissance structures. The building, which was never completed, was constructed by King François I in part to be near to his mistress the Comtesse de Thoury, Claude Rohan, wife of Julien de Clermont, a member of a very important family of France, whose domaine, the château de Muides, was adjacent. [nb 2] Her arms figure in the carved decor of the château. Chambord is the largest château in the Loire Valley; it was built to serve as a hunting lodge for François I, who maintained his royal residences at Château de Blois and Château d'Amboise. The original design of the Château de Chambord is attributed, though with several doubts, to Domenico da Cortona. Some authors claim that the French Renaissance architect Philibert Delorme had a considerable role in the château's design, and others have suggested that Leonardo da Vinci may have designed it. Chambord was altered considerably during the twenty years of its construction, (1519–1547), during which it was overseen on-site by Pierre Nepveu. With the château nearing completion, François showed off his enormous symbol of wealth and power by hosting his old archnemesis, Emperor Charles V at Chambord. 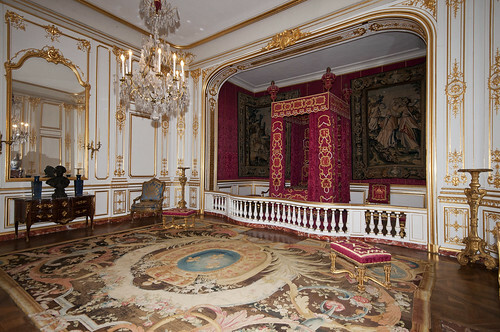 In 1792, some of the furnishings were sold and timber removed. For a time the building was left abandoned, though in the 19th century some attempts were made at resotration. During the Second World War art works from the collections of Louvre and Compiègne were moved to Château de Chambord. Now open to the public, in 2007 the château received 700,000 visitors.